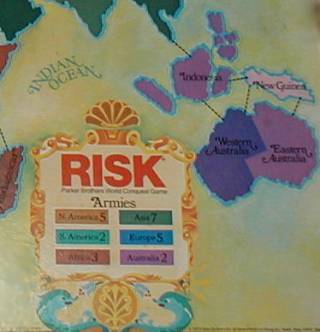 One of my favorite board games is Risk. I have lots of fond memories of getting annihilated by my family members (I don't think I've ever played the game without being the youngest person at the table) and have long since mastered the fundamentals. I also hold it responsible for my early knowledge of world geography and geopolitics (and thus my early thoughts were warped, but at least I knew where the Middle East was, even if the map is a little broad). The key to Risk is Australia. The Greeks knew it; the Carthaginians knew it; now you know it. Australia only has four territories to conquer and more importantly, it only has one entrance point, and thus only one territory to defend. Conquering Australia early in the game guarantees an extra two armies a turn, which is huge at that point in the game. Later in the game, that advantage lessens, but after securing Australia, you should be off to a very good start. If you're not in a position to take over Australia, South America will do. It also only has four territories, but it has two entrances and thus two territories to defend. On the bright side, it's also adjacent to Africa and North America, which are good continents to expand to (though they're both considerably more difficult to hold than Australia). This being the internet, there are, of course, some people who have thought about the subject a lot more than I and developed many detailed strategies. The Map and Extra Armies: A different map is generated for each game. One of the other differences is that the number of extra armies (or Dice, in this game) you get per turn is based solely on the number of territories you control (and there's no equivalent to turning in Risk cards for more armies). This nullifies the Australia strategy of conquering an easily-defensible continent, but the general strategy remains: you need to maneuver your forces so as to minimize the number of exposed territories, slowly and carefully expanding your empire. Army Placement and Size: Unlike Risk, you can't choose where to place your armies (nor can you do "free moves" at the end of your turn, which are normally used to consolidate defenses or prepare a forward thrust). If you mount a successful attack, you must move all of your armies except one that you leave behind. This makes extended thrusts difficult, as you'll leave a trail of easily conquered territories behind you. This is one of the more annoying differences. Another difference is that any one territory can only have a certain number of armies (i.e. there is a maximum). This changes the dynamic, adding another element of entropy. Again, it's somewhat annoying, but it's easy enough to work around. Attacking and Defending: In Risk, the attacker has a maximum of 3 dice, while the defender has a maximum of 2 dice. Ties go to the defender, but attackers still have the statistical advantage, no matter how many armies are facing off. If both territories have an equal amount of armies, the attacker has the statistical advantage. In Dice Wars, the number of dice used are equal to the number of armies, and instead of matching up single dice against each other, they just total up the dice. If the attacker's total is greater than the defender's, they win. Again, ties go to the defender. So in this case, if two territories have the same number of armies, the statistical advantage goes to the defender. Of course, you generally try to avoid such a situation in both games, but again, the dynamic is quite different here. There's an LotR edition of Risk?!! I very much have to buy that...I love Risk. We used to play enormous, several week-long games of it study hall in high school...and snow days usually meant holing up at somebody's house for a marathon. I have LotR trivial pursuit, and that's pretty fun, though some of the movie related questions are annoying...who did what special effect and whatnot. Yeah, I'm pretty sure the map is different for the LotR version too. Trivial Pursuit asks about what tech guys created the special effects? Jeeze. I actually haven't played Risk in years. The last memorable occasion was when I played with a friend and his friends from college. They were an odd group. They brewed their own beer and built electronics for fun. Again, an odd group. And I actually won, after an hours long marathon game. I had an unfair advantage though - most of the players didn't know me at all, and had trouble reading me. I think they underestimated me. Wow, that's a pretty neat game! Very clever. You're invited to play! C'mon over! From what I've found, you need a group of people that you know well enough to have some nerdy fun with, but not well enough that they know everything you will do before you do that have fun at Risk. I don't care, I'm still gonna buy LotR Risk, that's just freakin' cool. LotR risk is cool. I like that there are things like fortresses to alter how strong a position is, and the map is definitely different from regular risk. You can play it like regular risk, though, without the extra LotR rules.